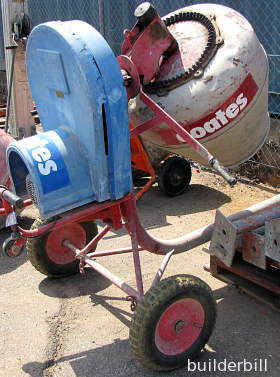 A machine for mixing cement and concrete which is driven by an electric motor. They are usually quite small, portable in some way and use household power for ease and convenience. Also called a concrete mixer. Small mixers like this are very convenient and being driven by an electric motor they are low maintenance. The wheels are for manoeuvring around the site and loading onto the back of a vehicle. This is not a tow able trailer. Some versions this size allow the wheel axle to be swung sideways so that the machine can be taken though standard sized doorways into rooms. This is sometimes done by plastering trades and as the motor is electric there is no concern about fumes, which would be a worry if a petrol engine was used in this way. Always clean up the mixer after use. It is ten times easier if the cement is still wet. After the last mix has been emptied out, the normal procedure for cleaning is to throw a couple of buckets of water and a few half bricks or rocks into the bowl and leave them tumbling around in there for ten minutes of so. Any cement or mortar still left can be got off by a hand wire brush. A way of removing layers of dried mortar is to belt the outside of the bowl with a hammer and a lot of the mortar will flake off. Don't do this with someone else's machine.